Cozy Cottage Newly Available for Winter and All 2019 Dates! ONLY 3.5 HOURS FROM THE NORTHERN SUBURBS OF CHICAGO!! Sturgeon Bay is as much as an hour closer and more convenient than many other Door County towns. In fact, from 94/294 all the way to Sturgeon Bay is now all (at least) four-lane highway. 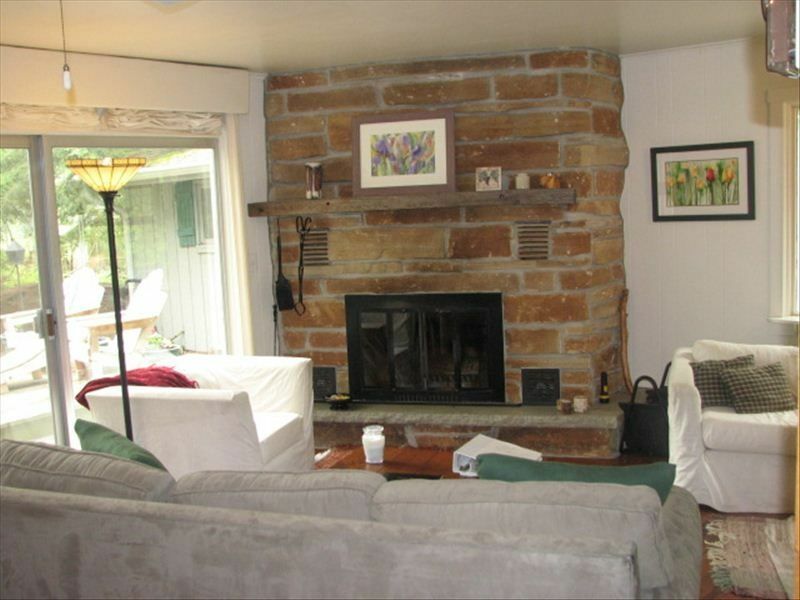 Hidden Glidden Cottage is a charming and clean and cozy two-bedroom, two bathroom cottage romantically hidden behind a sand dune on scenic Glidden Drive, east of Sturgeon Bay in beautiful Door County, Wisconsin! Glidden Drive meanders peacefully along the Lake Michigan shore. The house is nestled in the woods across the street from the lake and you have beach access rights to a wonderful sandy beach only 250 steps up the road. You will find that the private, picturesque location boasts decks on all sides of the house, as well as a peaceful screened porch. Since this is our family vacation home, you will find it equipped with all of the niceties and conveniences we like to find when we arrive. In the kitchen you have a microwave oven, full-size oven/stove, full-size refrigerator, disposal, toaster, blender, coffee maker & grinder, small food grinder, pots & pans, glasses, plates, bowls, cups, cutlery, etc. In the main bedroom you have a pillow-top queen-size bed, attached, newly remodeled full bath with marble-topped vanity, a Toto toilet and a bathtub, and a television hooked up to cable. The second bedroom features a queen-size bed, a television with cable and small, secluded and private outdoor deck with a porch swing. Both beds are furnished with upscale linens for your comfort. The guest bath features a cheerful sunflower motif and a walk-in shower. The bedrooms have Berber carpet. The great room has Hickory hard-wood floors. The kitchen is conveniently located in a corner of the great room, which also includes a dining area with a rustic table for six as well as a lounging area in front of a large, wood-burning, fieldstone fireplace. There is a CD/Cassette stereo as well as a television hooked up to cable and DVD/VCR combination. We have also included a small selection of movies, games and books for your enjoyment. The sofa in the great room is a queen-size sleeper with a memory foam mattress. Off to the north of the great room, through French doors, is the peaceful screened porch, which is furnished with comfortable white wicker furniture. Through the wall of windows to the east of the great room is a large deck with adirondak lounging furniture and dining chairs and a table, as well as a gas grill--perfect for outdoor dining and also for curling up in the sun or shade (depending on time of day) with a good book! Nature lovers will adore the view, and there are three bird feeders near the deck, as well as a bird bath. Bird seed can be found in the garage. For your convenience, there are a full-size washing machine and dryer in the closet adjacent to the entry hall. There are beach towels in the linen closet, and the garage is equipped with beach chairs and toys, tennis racquets, an ocean kayak, a basketball and a couple of children's bicycles. The rental fee includes all listed conveniences, normal cleaning (no dishes or pots left in the sink), washing of used linens and towels (one set per person staying), local and long distance telephone service and WiFi. We request a Damage/Breakage Deposit, which will be returned to you after the house has been turned over in good condition and we have received the keys back in the mail (if applicable). No Smoking & No Pets, Please. Door County has enacted a 5.5% hotel tax, to which this rental is subject. Rates quoted herein include the following components, which will appear separately on the rental agreement. These are: RENT, CLEANING, LINENS, and TAX. My wife and I and our two young adult daughters live in the northern suburbs of Chicago. We would love to have you and your family as our guests in our home away from home. My family and I have traveled to Door County since I was a child. My wife and daughters so loved spending time at my parents' home down the road, that we all decided that we wanted to own our very own slice of paradise. We enjoy the very homey feeling that our property has. It is a very comfortable home with many places for relaxation. Firewood is not provided, but is available in bundles for purchase at many local grocery stores and gas stations. Beach chairs and towels, Tennis Racquets, Ocean Kayak w/oars & lifejackets, Basketball hoop & basketball. This cabin is so cute and secluded. We loved the fireplace! This was a great little cabin! So cozy and out of the way. We went in the winter but would love to go back when we can enjoy the outside patios and firepit on a nice summer night! Would be great for families with kids or a couples getaway. Cozy cottage.Beds are comfortable. Nice outdoor space. Woods make it very private. We were there in fall. We all thought it would be a great place to stay for a week in the summer. The beach is close, although was too cold during our visit to enjoy. The water is well water. I would recommend anyone staying there who is used to city water to bring water for drinking. Peaceful, well stocked and close to everything. It was one if the most relaxing vacations in while. We (two couples) enjoyed our stay here. The cabin is well supplied (except bring your own bar of soap) and very comfortable. The setting is serene and secluded yet close to the beach and not far from parks, trails, and restaurants. You can do as much or as little as you like. The beach is partly sandy and partly pebbly, but not crowded. If walking to the beach access is difficult, you can drive and park there with no problem. The owner is very responsive. Very quiet retreat...rustic and comfortable at the same time. We stayed here for a few days of the 4th of July. When we arrived, the house had not been cleaned from the previous renters: dirty sheets, dishes, etc. I left a VM for the owner. The cleaning lady arrived soon thereafter but not before we started our own cleaning efforts. The owner was very responsive, but it just didn't start our vacation on the right note. One of the main reasons I booked this house was because of the "250 steps to the beach" and the photo of the nice sandy beach. It might be 250 steps to the beach, but it is more than that to get to the public access trail to get to the beach. And the beach is all pebbles/rocks - not sand. Our favorite part of the house was the screened-in porch. Nice to sit in and view the deer in the woods. Plenty of outdoor deck space. It was a very quite and peaceful place. The house is rustic and has some quirks. We were only there mainly to sleep, but didn't think the house lived up the price per night. Very sorry to hear that you were disappointed. We tried very hard to make the stay happy after our cleaning ladies lapse, and refunded the entire cleaning amount $100.00 immediately. Rates for holidays may be higher. Rates are subject to change until the time of booking.